Pork belly is a fantastic and relatively inexpensive cut of meat. The generous covering of fat gives great flavour, brilliant crackling and prevents the meat drying out. Tom serves his with a fresh salsa to cut through the richness of the dish and lentils to provide substance. Bring 1litre/1¾ pint of water and all of the brine ingredients to the boil. Make sure the sugar and salt have dissolved, then remove from the heat and leave to cool. Place the pork belly in a plastic container with a lid. Pour the brine over the pork to cover and seal the container with the lid. Transfer to the fridge for 24 hours. Remove the pork belly from the brine and pat dry. Preheat the oven to 150C/300F/Gas 2. Place the pork belly onto a wire rack suspended over a baking tray. Roast in the oven for 2½-3 hours, or until crisp and golden-brown. Once cooked, allow the pork to rest for at least 30 minutes. Heat a little oil in a saucepan set over a medium heat and add the bacon. Cook until crisp, then remove the bacon and add the onion to the pan. Fry until soft and translucent. Return the bacon to the pan. Stir in the herbs de provence and the lentils and cook for 1-2 minutes. Add the white wine and bring to the boil. Pour in the chicken stock and bring to a simmer. Reduce the heat and cook for 30 minutes, or until the lentils are just soft. For the salsa, blanch the mint and parsley in a pan of boiling water for a minute. Remove from the pan, keeping the water boiling, and plunge into ice-cold water. Add the cabbage leaves to the boiling water and after two minutes place in the cold water with the herbs. When the leaves are cold, drain them thoroughly and squeeze to remove any excess water. Chop together the cabbage, mint leaves and parsley leaves. Add the grated garlic, chopped anchovies and capers. Put this mixture into a bowl with the chopped shallot, salt, cayenne pepper and lemon zest. Mix in the olive oil to make a rough salsa. 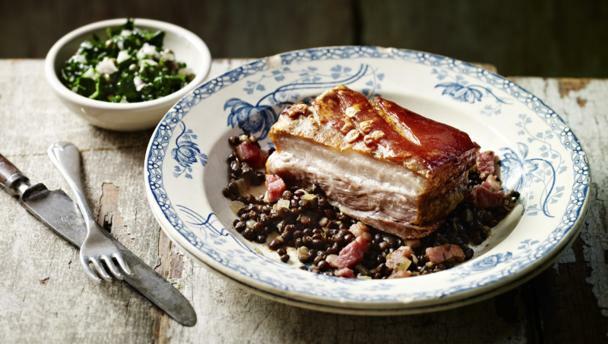 To serve, slice the pork, spoon the lentils into a large serving bowl and serve with the salsa. When brining your meat, make sure the box is big enough so that the meat can float, keeping the skin mostly out of the brine. This will help with crackling. If at the end of the cooking time, the skin still hasn’t crisped, you can remove it from the meat and heat it separately at 220C/200C (fan)/Gas 7 for 15 minutes or until it crisps up. This dish is quite salty, so if you don’t like such strong salty flavours, rinse the brine off the meat before patting it dry and roasting. A thick cut of pork belly with less surface area will also mean less salty exterior and more sweet middle.